International family law is expanding as people travel more and spend time with people from different countries. International personal relationships produce an abundance of conflict and litigation. It is hard enough for people to live together when they share a similar background, but it is far harder when they are from different countries, cultures, religions, ethnicities, educational experiences, languages, traditions, and family structures. The resulting pressures may become especially acute when international couples have children and disagree about such matters as child-rearing methods, the role of in-laws, proper education, religious issues, and ultimately the desire of one of them to take the children “back home” to his or her country of origin. When international personal relationships dissolve, the legal work is often extremely challenging. I have focused on such work for many years and have found it a great way to leverage my international know-how and experience gained as an Anglo-American national with a Japanese wife and children of various citizenships, who has lived, worked, studied, and run businesses around the world and who has taught law on three continents. The financial aspects of international family law disputes are often complex and difficult to resolve. But when children are the subject of such disputes, the challenges are often greater and the emotions generally run far higher. Simply put, money can be divided but children cannot. Divorcing parents who stay in the same town can often make sensible arrangements to share the parenting of their children, and if they cannot, a local court can issue appropriate orders and also enforce them as needed. But when the parents cannot even agree on which country to live in, all bets are off. I represent many parents who live in desperate fear that the other parent will abduct their child to another country and that they will never see the child again. I also represent many parents who desperately want to “go home” with their child to their country of origin. When an international client asks as basic a question as, “What law governs our case?” the answer may well be far from clear. We must often advise that it will depend overwhelmingly on which court--or courts--will have jurisdiction over the case. Although the courts in the state in which the child is currently located have exclusive custody jurisdiction from their own perspective, if the child is taken to visit another country, the courts there will often have jurisdiction under the local law of that country to determine what is best for the child. 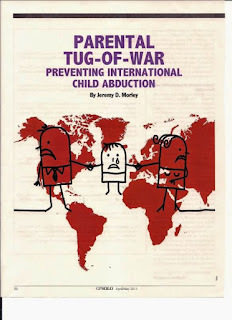 In addition, these cases often have a strong international law component: More than 80 countries, including the United States and most developed countries, have adopted the Hague Convention on the Civil Aspects of International Child Abduction, which requires that children who have been “wrongfully taken” or “wrongfully retained” overseas should normally be returned promptly to their country of habitual residence. In practice, international child custody cases often yield complex and messy conflicts between the laws and courts of different countries, demonstrating serious clashes of societal views about culture, religion, gender roles, parental rights, and children's rights, as well as of the role of the legal system in intervening in disputes about children. An increasing number of cases involve the prevention of international child abduction. Let's assume that you receive a frantic call from a client somewhere in the United States, who tells you, “I'm sure my spouse is about to take our child to [India/Japan/China/Colombia/England/Germany] and they will never come back. Please help!” What do you do? • You must discuss the passport issue. Most likely you should talk about how to secure the child's passport. You might discuss the location of the other parent's passports (recognizing that it is that person's property). You will need to alert the client to the fact that control over passports does not create complete security because many foreign consulates issue renewal passports or other travel documents to their own nationals, without requiring the consent of the other parent and frequently even in the face of a U.S. court order. You should discuss how the U.S. State Department's Office of Children's Issues might help ensure that no new U.S. passports are issued. • You should talk about how to track the child's whereabouts. Who can watch the child? Should you alert school authorities? What about placing a GPS tracking device in the child's clothing or cell phone? What about alerting the police or hiring a private investigator? • Perhaps your client should contact the airlines to discover if the other parent has bought airline tickets for the child. Perhaps you should write to the airlines to demand that they prevent the child from boarding. • You should discuss whether your client should contact other family members about the issue and what to say to them. • You should advise your client how to instruct the child as to what to do in case of an emergency. • You should advise your client about collecting and securing evidence for a potential court hearing. You may well want to secure an emergency restraining order very promptly from the family court. An initial temporary order should be easy to secure, but it will be far more difficult to keep such an order in place over the long term or to ensure that it has sufficient teeth to be effective. The United States has no exit controls, with certain exceptions, and a mere court order will not trigger the kind of effective checks that other countries have in place to prevent children from being taken out of the country by one parent or family member. Ideally the short-term solution should be to give sole custody to your client and to require that any access by the other parent be strictly supervised. The long-term burden will be strongly on your client to present compelling evidence sufficient to justify what the court will likely see as extraordinary relief. That evidence must be of two distinct types. First, you must establish that the other parent represents a serious risk of being an international child abductor. Second, you must show, if appropriate, that the foreign country's legal system will not return an abducted child at all or will do so only after great delay and expense. There will be a significant interplay between these two factors. The more that you establish a strong likelihood that the other parent will abduct the child, the less evidence you should need that the country in question presents a high degree of risk. So if the potential country is one such as England or New Zealand, which have strong and effective laws and systems in place to return abducted children, you will likely need very strong evidence of an anticipated abduction. Conversely, if the country presents an obviously greater risk of not returning an abducted child (think Japan or Venezuela), much less evidence of the likelihood that the particular parent will be an abductor should be required. Your evidence concerning the specific parent should focus on establishing as many of the so-called risk factors as possible. These factors are well established and have been codified in the Uniform Child Abduction Prevention Act (UCAPA). The most compelling evidence would be clear proof of a threat to abduct. Surprisingly, some parents make explicit threats in emails. More typically you will need to build a circumstantial case based on such factors as the parent having moved money overseas, vacated a residence, made international job inquiries, retained few ties to the United States, or kept strong connections to the foreign country and community, or being disdainful of the United States. In order to show that the foreign country's legal system will not return an abducted child at all or will do so only after great delay and expense, you will start with the Hague Convention. It will be highly significant if the country has not signed the Convention or if the United States has not accepted its accession. However, just because a country has signed the Convention does not mean that it will enforce it. As a signatory, Mexico is obliged to return abducted children promptly; in reality, it does not do so, as the U.S. State Department has repeatedly reported. Likewise, just because a country has not signed the Convention does not necessarily mean that it will not return abducted children. For example, Singapore has not yet acceded, but its courts follow the spirit of the Convention. Frequently you will need to ask the court to consider and evaluate the real facts as to a country's legal system. Generally speaking, U.S. judges are extremely uncomfortable evaluating another country's legal system and predicting the results that may be expected of a case overseas. Although such reluctance is perfectly understandable, it must be overcome. It is absolutely essential in this area that judges should not shirk from their responsibility to judge whether or not a child is likely to be returned from abroad if a parent or others in his or her family decides to keep the child in that country. How do you prove that a foreign country's legal system in international child custody cases is ineffective, corrupt, or slow? How do you establish the extent to which the courts in another country will recognize and enforce foreign--and especially U.S.--judgments, particularly in the family law area? Or the extent to which discrimination--sexual, religious, ethnic, or national-- might impact the issue in the courts of that country? And how do you convince a court that it is both appropriate and necessary for it to act as a judge of the legal systems in place in other countries? Publicity may sometimes be helpful. In 2009 my client's children were abducted from Tennessee to Japan. The Tennessee court then gave sole custody to my client, who went to Japan and tried to bring the children home to America. Instead, he was jailed in Japan. We quickly launched a high-profile campaign to secure his release and to highlight the fact that Japan is a haven for international child abduction. The client was then freed. While he has not seen his children again, at least the world now knows of the problem. The U.S. House of Representatives has now condemned Japan in extremely strong terms, and the Office of the Secretary of State has now joined with a host of other countries in demanding that Japan change its laws and sign the Hague Convention. One extremely constructive result of the campaign is that judges are now far more aware of the dangers of allowing children to be taken to particular countries if there is a real reason to suspect that the child may not be returned--and are aware of the firestorm of publicity that such cases can elicit. In subsequent cases concerning Japan, this has enabled me to be far more successful than before in persuading courts to prevent children's visits to that country. What if you are representing the other side in these cases? Perhaps your client genuinely wants to take the child for a limited family visit to his or her country of origin. Or perhaps your client came recently to the United States from another country with an American spouse, and now that the relationship is over wants to “return home” with the child. You may well need to discuss with the client that acting unilaterally might lead to a criminal as well as civil difficulty. For example, the International Parental Kidnapping Crime Act of 1993 makes it a federal felony to remove a child from the United States with intent to obstruct the lawful exercise of parental rights. Once a federal warrant is issued, Interpol may issue a “red notice” seeking the person's arrest wherever found. If a client tells you that he or she intends to covertly take and retain a child overseas, you need to exercise great care--you may have a duty to report the planned felony to the police, notwithstanding the attorney-client privilege. In presenting an application to a court for a temporary visit with a child overseas, you will present those facts and those arguments that show that the client is unlikely to abduct and that the country in question is one that respects U.S. custody orders and returns abducted children. In a case for an Italian client living in New York, I offered testimony that Italy was in full compliance with the Hague Convention and that its performance was significantly better than that of the United States. The court accepted my expert testimony and authorized the visit. If the request is for relocation, the burden of proof on the applicant is far higher. Domestic child relocation cases are generally difficult to win, and international relocation cases are much more so. They often require lawyers to present evidence as to the legal, social, cultural, political, economic, religious, and educational environment of a foreign country and, in particular, as to whether a U.S. custody order will be recognized and enforced in that country. It is generally a major mistake for a lawyer to present any such case without having worked intensely with the client to prepare an attractive relocation package. The plan should demonstrate the serious steps that the parent has taken to secure optimal conditions for the child and the client in the proposed new location. Equally important, it should establish that the taking parent will not merely permit the left-behind parent to participate in the child's life but will actively encourage and genuinely promote such ongoing contact. In this article I have been able to provide no more than a brief introduction to a fascinating area of the law. International child custody cases are always stimulating and sometimes extremely frustrating. But when a client e-mails to say, “Thanks to you, my children are safe” or “Blessings, thanks to you, I got the kids back,” they can be the most rewarding cases of all. Jeremy D. Morley is a New York lawyer and the author of International Family Law Practice. His firm handles family law cases in New York and New Jersey. He consults with clients and lawyers globally on International family law matters, working with local counsel as appropriate. He frequently acts as an expert witness on International family law. He may be reached atwww.international-divorce.com.